Ana Vicente RVN in one of our full time qualified Nurses. She finished her qualification in Veterinary Nursing by the ACOVENE credited, Agrarian School of Viseu, Portugal, in 2011. After graduation she kept working at her training placement practice for 5 years, working her way up to head nurse. In this time she gained major experience in small animals, livestock and exotic pets. 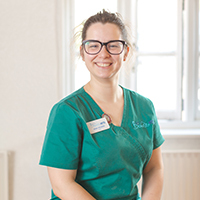 She then decided to try a different path in the veterinary nursing world, and joined Boness Vets in 2016, seeking professional development in a hospital environment. Ana’s main professional interests are surgery, anaesthesia and critical care. In Portugal she has 4 pygmy goats, here, for now, she just keep “spreading the love” to our patients.